Providing you the best range of knitted safety gloves, double palm leather gloves, resistant heat hand gloves, full leather gloves, cotton canvas glove and industrial rubber gloves with effective & timely delivery. 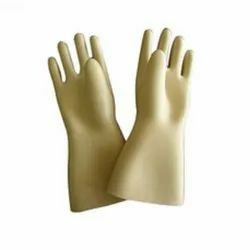 Banking on the skills of our qualified team of professionals, we are involved in providing a high-quality range of Double Palm Leather Gloves. A must for anyone Melting and working with HOT Metals. these are our longest pair of gloves. Gloves used in smelting operations, are rugged and dependable, protect your hands from heat, hot steam, sharp edges and are resistan to abrasion. A must for anyone Melting and working with HOT Metals. Supported by a highly qualified and skilled team we are renowned providers of super fine finished Full Finger Leather Gloves. Keeping in mind the application of these products, these are precisely engineered by experts. These products feature high chemical resistance, heat tolerance, abrasion and wearing resistance.Equipped with all these premium features these products are very popular in the chemical industry. We offer these products in a range of sizes for the varied needs of the customers. All these products are priced economically for maximum client satisfaction. We are the leading manufacturer and exporter of Rubber Gloves and our product is made of good quality. Made from 100% highly purified natural latex. Tested as per indian standard 4770 – 1968. 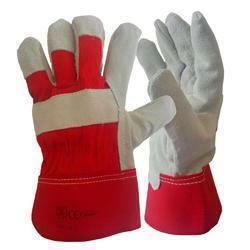 We are the leading manufacturer and Exporter of Hand Gloves and our product is made of good quality. We are reckoned as one of the prominent genuine industrial leather hand gloves manufacturers in india. Full split leather hand gloves are a popular heat resistant glove for welding applications.The two piece design and inner cotton lining make them comfortable for the user. Additionally, customers are eased with the availability of the leather safety hand gloves at affordable prices. 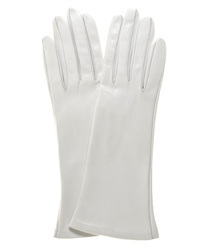 We are manufacturer and dealers of various hand gloves. Light duty handling in dry conditions. HIGH-QUALITY: 100% GENUINE A-Grade soft LEATHER. Durable protection for hands to handle hot objects and tools safely. Best protection for safe and comfortable welding. 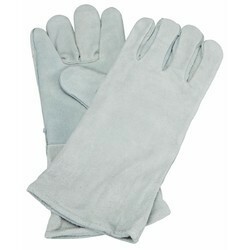 Heavy duty, fire flame heat resistant, safety Fireplace gloves. Delivers best protection for hands and performance in any kind of work, including forge, furnace, fireplace, gardening, camping, barbecue, wood stove, campfire etc. DESIGN, COLOR and SIZE: FLEXIBLE DESIGN - Reinforced wing thumb design for maximum flexibility. It means holding items and operate easily. Grey, fits both men and women. Welted fingers protect against burning. Designed to provide the best protection for safe and comfortable welding. Very flexible to hold items and operate easily. This gloves not only for welding, but also use for other work and home tasks. Idea for Welding Gloves, Work Gloves, Safety Gloves, Heat Resistant Gloves , Gardening Gloves, Camping Gloves, Cut Resistant Gloves, Fireplace Gloves. 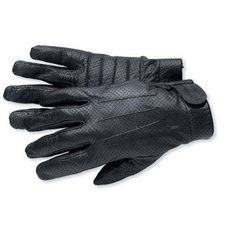 All-leather gloves are lightweight yet durable and have a velcro closure. Great for Band Members or Drum Majors. Glove extends approximately three inches below the base of the hand. Perfect for drum majors and military. Men's sizing (for women's sizing, order a size smaller). : Cotton Gloves. Rubber Dots prevent from slip. Used to handle delicate Glasswares. Both side dotted hence easy to wear. Useful while cleaning and handling hot or cold Dishes. 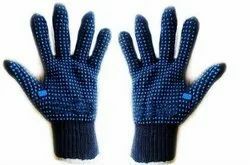 Description: Cotton Gloves With Rubber Dots helpful for handling fragile Items . Doesn't let Slippery cutlery slip from hand and gives grip to hold it properly especially while cleaning and serving. Medium Size. Girth 8.5" to 9", Full 1 feet length. Seamless knitted gloves made of cotton are used in a wide range of applications, from heavy industrial work to assembly and even as liners underneath other gloves. The knit construction provides good dexterity, while cotton helps keep the hand dry and comfortable. 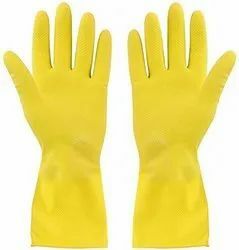 Economical, verstile and environment friendly, these gloves are available in different styles and shapes for use in industries of various scales. 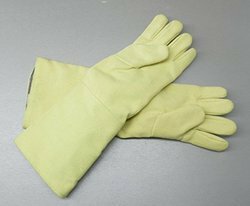 We are leading manufacturers of Chemical Resistant Gloves. Our range of Chemical Resistant Gloves are manufactured chemical resistance industry standards. Whether you need a premium gauntlet offering the highest protection, or an everyday disposable glove we have the right product for your need. we are manufacturer and dealers of acid resistant hand gloves. Packaging Details: 12 pairs package . We are a well-known organization that is involved in wholesaling a broad array of Leather Gloves. All these gloves are manufactured using excellent quality leather that is sourced from most trusted vendors of the market. Our range is offered to customers in a spectrum of specifications at industry-leading rates. we are engaged in offering a wide collection of Classic Woolen Gloves. 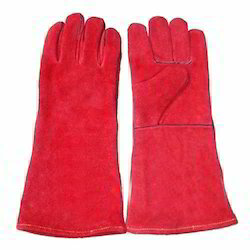 These gloves are crafted using high grade woolen thread that is procured from reliable vendors of the industry. The offered gloves are available in various captivating colors, sizes and patterns to meet the varied needs of the clients. These gloves are broadly praised for smooth texture, wear & tear resistance and easy to wash. We offer these gloves to our clients’ at the most reasonable rates. Basic hand protection from dirt, dust and other impurities. Ideal for material handling, maintenance and assembly jobs. Not to be used near open flames, fire, molten metal, etc. or for handling any heated, sharp or pointed objects, oil, chemicals, solvents, paints, epoxy etc. Do not use in case of any allergic reaction, rash or any other skin effects. We are offering Half Leather Canvas Gloves to our clients. 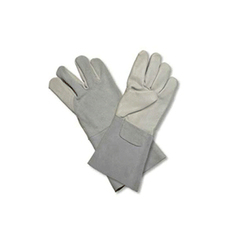 These are leather palm cotton gloves also known as chrome canvas. Cuff & back side of palm made out of reinforced fabric. It is very soft and durable. we are dealers in leather gloves(welding gloves). available in red and grey colour. Industrial Leather Gloves offered comes designed and developed in superior construction finish for lasting and safe usage. Welding Hand Gloves made of soft and thick split leather. The thickness of leather is more than enough. Inside the gloves, a soft felt lining is used to comfort the hands. This glove is fully stitched with Kevlar thread. We are the leading manufacturer and Exporter of Dotted Hand Gloves and our product is made of good quality.